Most people are so excited about exploring London that they often overlook how they are actually going to get into London after they arrive on their flight. But hey- it’s a big piece to your travel puzzle because the truth is, the airports are all pretty far away from Central London. If you don’t plan out your way into the city… you might end up spending a lot for a black cab to take you in once you arrive (which is what a lot of people end up doing). While I’ll always love the iconic black cabs of London, I will say that I think there are more economical ways to get yourself into the city center from London’s Heathrow airport. Let me walk you through the options and you can choose which would work best for your trip. With a little bit of planning, you’ll be able to to get into the city with your choice of whatever of the below options works the best for your trip, and before you can say “Mind the Gap,” you’ll be zooming your way into London to get the real fun started. THE UNDERGROUND | You can actually take the tube all the way to/from Central London on the Piccadilly line. It will take approximately 50 minutes to get in, and this is the cheapest route possible. The price of a single journey between Heathrow and Central London costs £6 per person, each way (as of March 2019). This is a great option if you’re traveling light and are not in a hurry. If you’ve got small kids (and accompanying gear, like a stroller) or a heavy luggage, this can be a tricky option as most train platforms will require hauling them up stairs. Tickets for these can be purchased upon arrival from the machines by the trains (they also take Apple Pay!). This is a helpful site for additional information on taking the underground to Heathrow. THE HEATHROW EXPRESS | This fast train goes to/from Heathrow into London every 10 minutes and will get you there in about 15 minutes. Amazing right? Tickets are £19 per person, one way. However, once you get to Paddington, you still will have to take the tube or a cab to your next location. 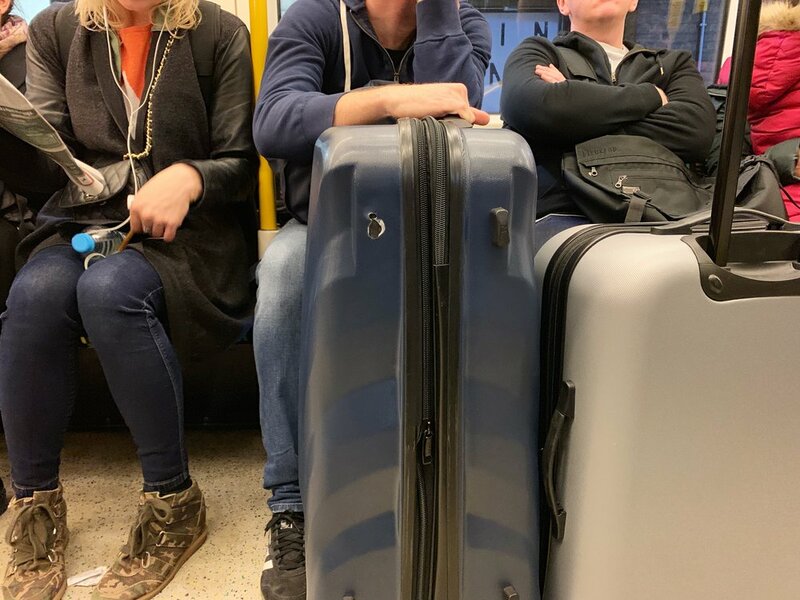 So by the time you add it all up, and schlepp your bags to/from the train terminal at Heathrow and then through Paddington out to the taxi rank or down through the tube and up again…. It’s kind of an expensive and physical trek. I’d opt for this if I was traveling solo (if there’s more than one of you, an Uber will be cheaper in the end) and if you have a small bag. Tickets for the Heathrow Express can either be purchased in advance, or very easily at the airport upon arrival. UBER | Ubers are a cheap taxi into Central London from Heathrow. Most rides cost around £35-40, but you have to call for a driver once you’re outside of arrivals and then wait for 10-15 minutes as they enter the airport and come up through into a parking garage. After that, you have to go find them and get your luggage all the way to the car. (They can’t come inside and wait for you, so you’ve got to be ready to haul your bags + selves outside to the bank of lifts and get to the right floor and section of the garage.) It’s a fine option that I’ve done many times, but it’s not my favourite. It always seems to take ages, and if you’re traveling with loads of bags, the standard issue London Uber (a Toyota Prius) just has a small space in the back. I use Ubers from Heathrow when it’s just one or two of us. Beyond that, it gets a bit crazy and stressful. Once you get in the car, it’s only about 40 minutes into Central London if traffic is moving well. BLACK CABS | I do love a good black cab, and while they are readily available at Heathrow, they are really expensive! As they are metered fares, they can go from pricey (£70-80) to really expensive, if traffic slows down. They can fit an amazing amount of luggage in them, and they’ll know exactly where you need to go and the best way there. Plus, it’s a great cultural experience. (Just one, in my opinion, that I think can be as easily enjoyed for shorter rides in/around the city instead of for this particular journey.) If you’re traveling with a stroller, you can push it directly into the middle of the cab and it is legal for the cab to drive with a child in it. Obviously, this is to the discretion of the parents/guardian, but it is legal. Again, this is about a 40-minute ride to Central London. FAMILY TRANSFERS | If you’re traveling with kids, this is a great option that will provide car seats for children for around £100 (as of March 2019). The fleet of cars is all large cars (like vans), so you’ll be able to get all the bags and stroller packed in the back. Plus, two car seats are included with the booking. Additional carseats are available, at an extra charge. You can choose from either front- or rear-facing, or a combination of the two, if you need one of each. You can also find cheaper companies with google searches that offer rides into London for around £50 per car, but I find that these smaller companies often don’t want the driver to come into the arrivals hall. After a long flight with bags, I’m often not in the mood to push bags around and track them down in the parking garages. Find out more about traveling to London in my travel guide! Subscribe to my Youtube for more about London!